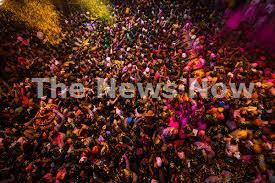 Lucknow, Mar 21: Festival of color, Holi, is being celebrated in Uttar Pradesh with traditional fervor and gaiety. Children and elders sprayed color and gulal on each other and later offered sweets and special prepared gujiyas and paper. With wishing, 'Happy Holi' people embraced each other to convey their best wishes. The festival is being celebrated in a peaceful manner and there is no incident of any untoward incident from anywhere said Director General of Police O P Singh here on Thursday. As this year Holi is being celebrated during the Lok Sabha polls, hence police are more vigilant as the Election Model Code of Conduct is enforced in the state. UP Governor Ram Naik and Chief Minister Yogi Adityanath have wished the people of the state on the festival. Mr. Naik met the families of his staff at the Rajbhawan and exchanged greetings. CM Yogi is in Gorakhpur and worshipped at the Gorakhnath temple this morning and exchanged greetings with the people. In Lucknow, a special Holi procession was brought out in the old Chowk area where politicians and others joined to celebrate the festival. The celebration of the festival started last evening with Holika Dahan and people started playing Holi.